Spring just officially arrived and it’s that time of year when the term “spring cleaning” starts flying around. In our house it’s usually a time to purge and organize; the cleaning naturally happens as we move throughout the house. Since the big move happened this month we’ve been doing a lot of purging and organizing. The first 2 rooms to get the treatment were the bathrooms and the kitchen. In my opinion the easier rooms to purge. They’re communal and there are far less items with personal attachments than the bedroom or office. It’s a simple keep, toss, donate situation. 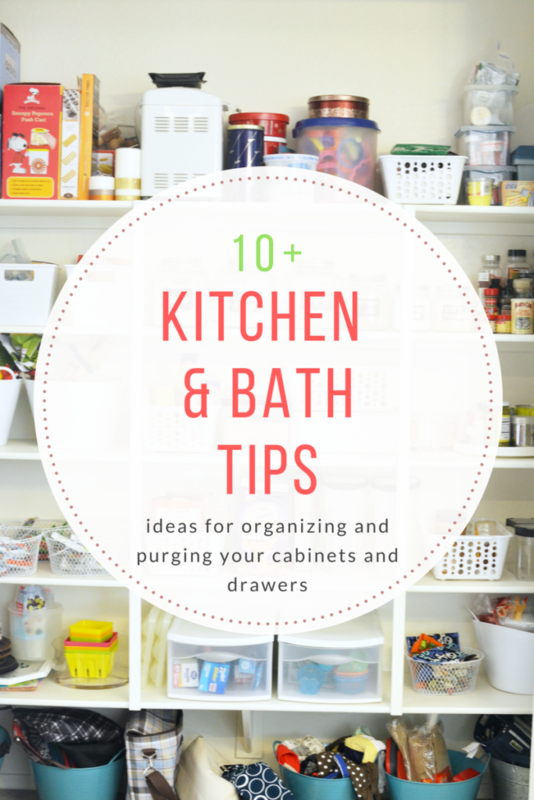 While it’s fresh in my mind I’m sharing my simple tips for organizing your kitchen and bathroom. 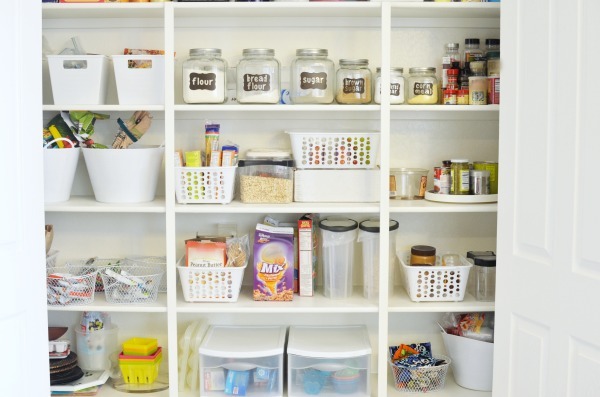 These steps and tips will help you keep the pantry, fridge, and under cabinets organized and uncluttered. My favorite storage solutions from Wayfair keep everything visible and organized so you know what you have, what’s expired, and what needs refilling. No more stockpile of ketchup (I had 3 large bottles at one time because I didn’t see them hiding at the back of the pantry) or mountains of pain reliever bottles. You’ll be able to see what you have and find it easily! Checkout these easy tips below then find out what my favorite products are for organizing the kitchen and bathroom. Check the fridge, medicine cabinet, pantry, and bathroom for any expired products. You might be surprised how short a shelf life medicines sometimes have. In the fridge use bins. 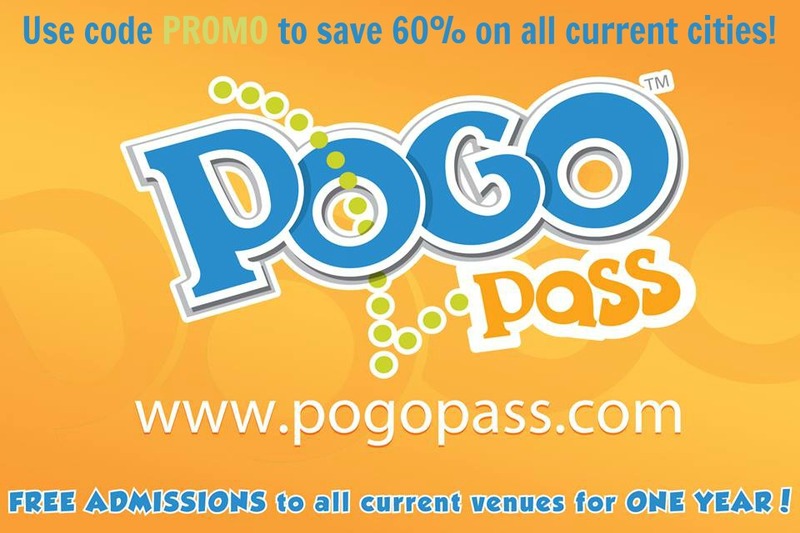 This helps to catch any spills and makes finding things fast and easy. It also cuts down on clean up. The bins hold any stray crumbs or liquids. We organize ours by drinks, leftovers, spreads, etc. The same thing works great in the freezer. With the newer drawer design freezers it’s often hard to keep track of everything when the freezer is full. Bins allow you to organize by type of food and make searching so much easier. 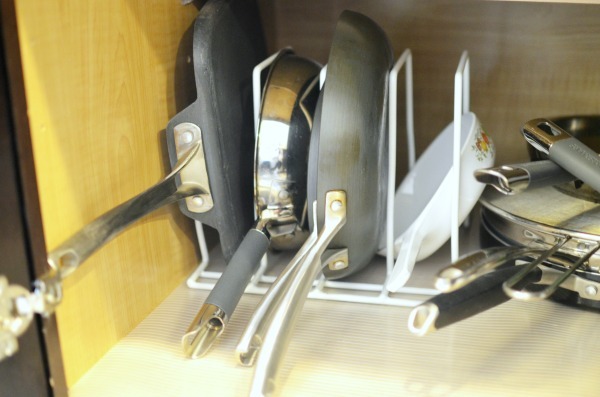 Under the cabinet use a cookie sheet organizer to keep all your pans in line. It not only makes it easier to quickly find and grab the pan you want, but it also prolongs your pans and reduces scratching by not stacking. 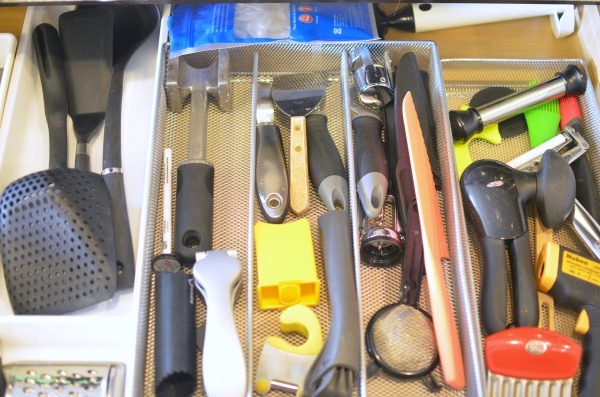 Use drawer organizer to keep everything from shifting and containing small utensils and tools. In the pantry employ a similar system to the fridge and freezer. 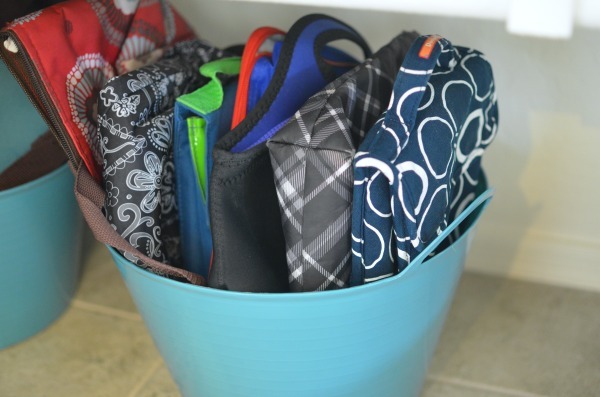 Grab buckets and bins to store all your dry and can goods. Large buckets work great for chips and bagged snacks. Square bins are perfect for holding pasta and cracker boxes. Large labeled jars work great for baking supplies. 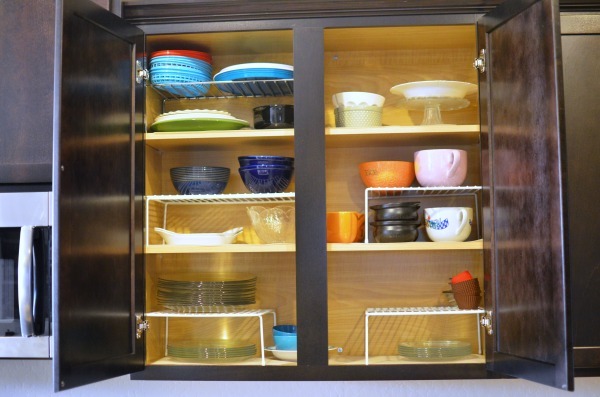 This is another great place to use small under cabinet drawers. Instead of giving up one of your kitchen drawers for bags and wraps put one in your pantry to tame these infrequently used items. 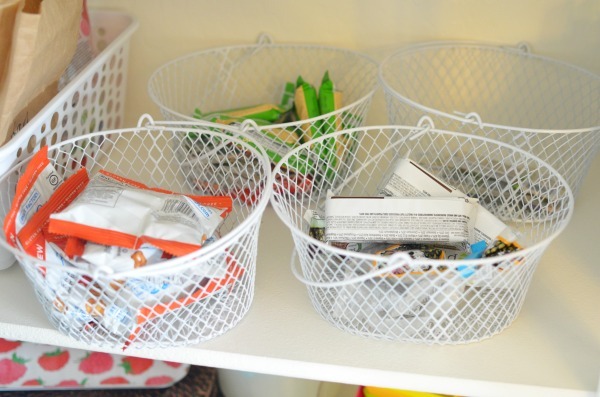 Use small baskets to keep snacks out for easy grabbing. My kids know they can grab something straight from one of these bins at snacktime. Use shelf risers to get the most out of your shelf space. One on each side adds in so much prime dish real estate. Bins go on the normally unused space on the ground to hold lunch boxes and bags. 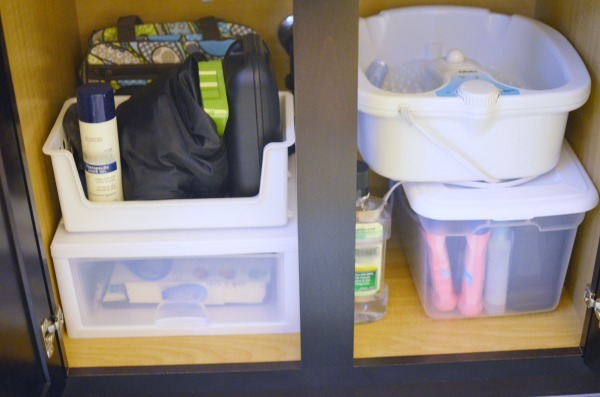 Use clear containers, shoe boxes, or drawers under the bathroom sink to organize all your products. Keep items like sunblock, hydrogen peroxide, and rubbing alcohol in large lidded bins. For items you use more regularly try small drawers or bins with a closed bottom to store them right on hand. 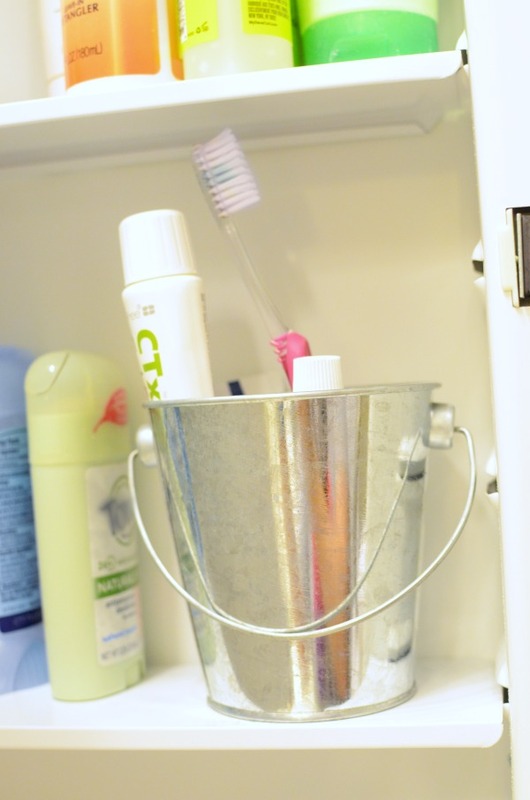 In the medicine cabinet use cups or small pails to hold your toothbrush and toothpaste. They work great for other tall objects like nail files, clippers, or makeup brushes. 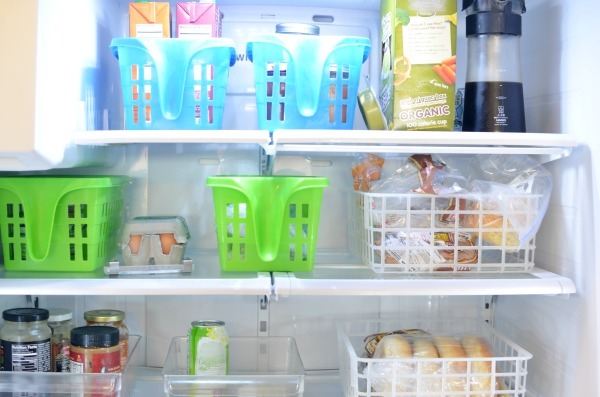 Below you’ll find some of my favorite products for organizing your cabinets, pantry, and fridge/freezer. I love anything that keeps things compartmentalizing for easy finding and moving for cleaning up. 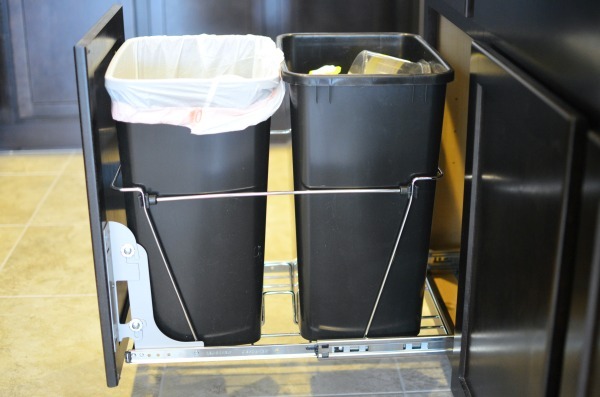 Most are bins, baskets or drawers that hold in the mess for wiping down shelves easily. Then just rinse out the bins, dry, and re-0rganize. Great tips!! I will definitely try these tips! !